The Chuckit! Amphibious Boomerang Toy is a high quality flying and floating toy designed for active dogs who love being outdoors and in the water! It is made from a combination of memory foam and tooth-rugged nylon that allows it soar through the air or float high on the water. Designed to be highly visible and buoyant, the Amphibious Boomerang will keep your fetch fanatics entertained for longer. The Chuckit! 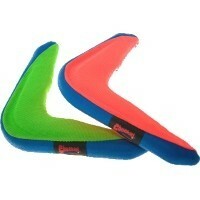 Boomerang is made strong and durable, ideal for a dog that loves playing rough and tough. Certain areas are rubber lined to provide a good grip but still easy on your dog’s mouth.